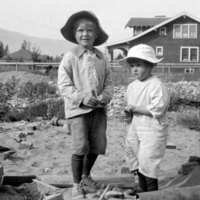 Helen and Joe Swan (children) at 1533 Jackson, Missoula. 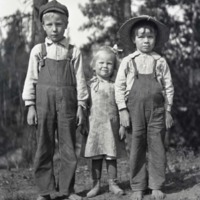 Three children hired to catch frogs at Yellow Bay on Flathead Lake in Montana, the two boys barefoot and wearing bib overalls. 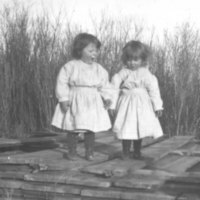 Dorothy and Cousin Edna Asbridge on top of pile of stacked wood at Lazy X near Roundup, Montana. 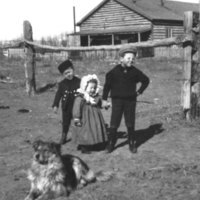 Vern, Hazel and Joseph Asbridge at the Willows at Lazy X Ranch near Roundup, Montana.